40G/100G Ethernet PCS/MAC IP Cores – Precise-ITC – ASIC / FPGA Innovation! 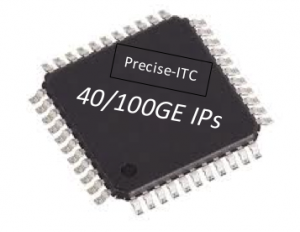 The Precise-ITC 40G/100G Ethernet IP cores are cutting edge solution to the 40G/100G Ethernet application. 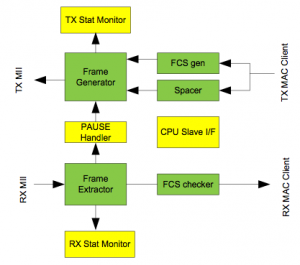 It supports the Physical Coding Sublayer (PCS) for 64B/66B, type 40G/100GBASE-R function based on the IEEE 802.3. There are 3 PCS Cores : 40GBASE-R, 100GBASE-R and 100GBASE-KR4 PCS+FEC Combined Cores. The PCS layer core supports 64B/66B encoding for transmission of data and control characters, and AM processing and for the case of 100GBASE-KR4/CR4 application, 256/257B transcoding, FEC calculation, and data distribution are also supported. All cores include insertion and extraction points for connection to an OTN layer. This core is suitable for use in switch or interface cards or any application that requires a PCS for 40G/100GbE. For a complete Ethernet solution, the PCS Core seamlessly integrates with the Precise-ITC 40G/100G MAC cores. Similarly, there are 2 MAC Cores: 40G MAC, 100G MAC. Comprehensive MAC/RS statistics are supported in all MAC Cores. TX or RX MAC statistics can be optionally “removed” to save logic area. All MAC cores are designed with low latency and cut-through features. The 1588v2 feature, 802.3br Interspersing Express Traffic Feature (IET) and 802.1Qbb PFC feature are available for 100GE MAC as optional add on.